Roxie here. I’m writing a post once again to help Mom. She’s been busy with other things the last two weeks, so someone has to bail her out. You remember that she and Dad decided to paint the kitchen last November and what a mess the house was in for weeks? (They’re really slow. Like watching paint dry.) Well, you’d think they’d have learned from that experience. But no way! Mom got the bright idea that since we did such a great job on the kitchen, and since it’s winter and we’re all stuck inside the house anyways, we should paint and add bookcases to the FruFru Room. (Dad calls it that because Mom hangs lace curtains in the windows.) So this place is once again in chaos. I don’t know where all their energy is coming from, but I’m pretty sure from the looks of them that they should be taking more naps at their age. I’ve attempted to help the project along by supervising, but once again all I get is aggravation. “Roxie, Dammit, get away from the paint!” “Roxie, Dammit, bring that brush back!” “Roxie, Dammit, that’s a bookcase, not a ladder!” “Roxie Dammit, get down from that ladder!” I just can’t win! Has anyone else noticed when Mom is involved in a project she always refers to me by my first and last name? And I wonder why my last name is different from ZuZu Sweetie Pie? And why don’t I have a middle name? Roxie Sweetie Dammit or Roxie Cutie Dammit or Roxie Snookums Dammit? And let’s not forget the book! I still don’t see any move toward writing a book about me. And to make matters worse, it’s been snowing. And if that isn’t bad enough, Mom has decorated the place with snowmen. I can’t find a chair or a window that isn’t already taken. Some of them even dance and sing. Why would anyone dance and sing about cold white stuff clinging to everything? I’m seriously thinking of putting myself up for adoption to the first blogger who makes me an offer I can’t refuse and comes from a place that always stays warm! I’m going to try to take a nap and dream of the days when we could all go outside and sit in the gazebo. Mom should be back on line soon, but until I get a better offer, I’m here for you. Take care and stay warm! Oh, yeah, Happy Valentine’s Day! I smiled and chuckled through every word of this enjoyable post! Thanks, Russ. 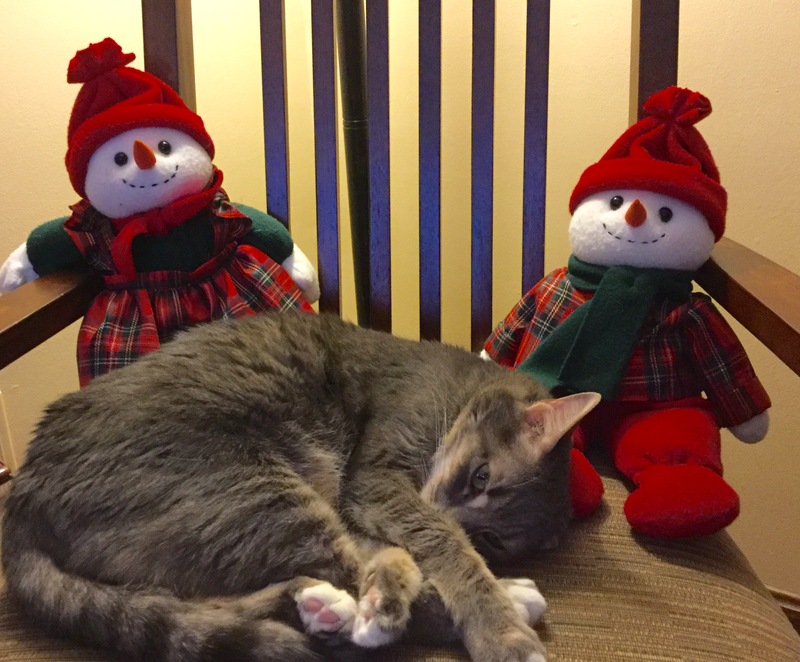 Roxie really does hate all of the snowmen around the house. Usually she pushes or tosses them on the floor. I think by March, I’ll have had it with the snowman theme, too. (I’ll bet Thomas would love it. )Are you packing for your trip yet? Roxie, dearest, I live in Phoenix and you’d love it here! The sun is shining ever so beautifully today, and its beams fall upon our comfy window seat, just begging for a cat to slumber there. The only question is, how do you feel about long plane trips? I’m afraid you’re some distance away. A comfy, warm window seat! Sun shining every day! Best offer so far! My Mom and Dad have been to Phoenix a lot, so I’ll make sure I’m in the suitcase (or the golf bag) the next time they pack! Happy Valentine’s Day to you, too, Roxie! This is so sweet of you Roxie, to help your mom in such a creative way… 🙂 Loved the post..
Nice to hear from you Roxie. Enjoy your nap. And a Happy Valentine’s Day to you, Roxie. BTW, Roxie Dammit is a very classy name, and if you decide to run away to sea in search of warmer climes, Captain Roxie Dammit sounds even better. Yes, I think that is a lovely title. And I could meet some of the cats in your tales, too. And I do love the water (if it’s coming from a dripping sink). Mesmerizing! Roxie, you are a minx! Actually, the two latest snow storms have been lovely especially since we didn’t lose electricity. Lots of power lines down because of the heaviness of the wet snow. It’s left some people around here with no electricity. We’ve been lucky, so yes, the snow is gorgeous where we are. 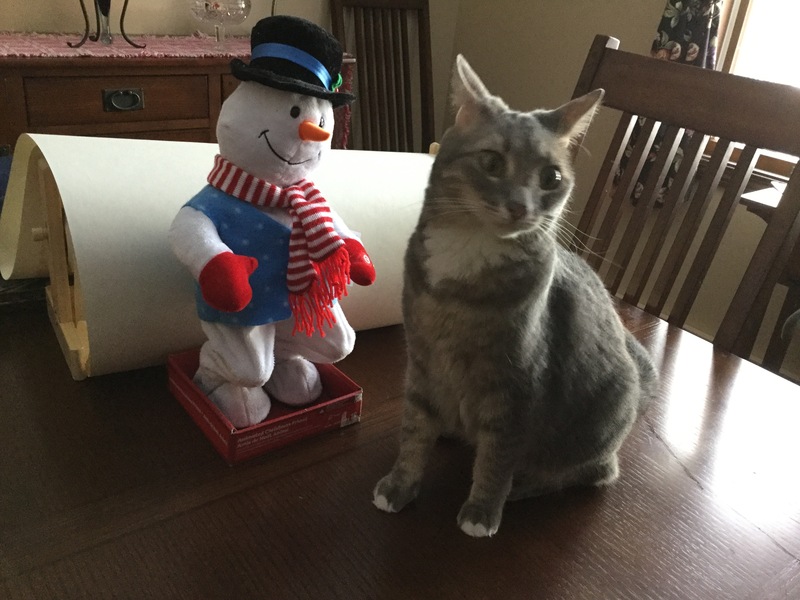 It was fun taking photos of the cats with snowmen. ZuZu is brave when Roxie is around, but if I turn on one of the snowmen that dances and sings, she goes running under the bed. Roxie is blasé about it all. Ha ha ha > A hilarious post bringing cheer to my day. How true though about names. My Mum calls me by my full first name. No one else ever does that. Have a wonderful Sunday. Roxie, you could come live with me and my cats, Adventure and Katie, but it snows in Colorado too. Also we live by a busy street and our kitties only get to go outside if they wear a leash. Do you like leashes? Two other kitties, snow, leashes…Hmmmm. Although I’d love to live with you, I think I’ll stick with C.J.”s offer out in Arizona. If that falls through. I’ll be in touch. Thanks for your concern regarding my appalling living conditions, though. Roxie, it’s warm here! and we never have that nasty white stuff. (sigh! if only!) (and oh for some cold!) However, the neighbourhood cats seem to have adopted me, so maybe it could be too crowded! You look snuggly and friendly. No dogs here at the moment. PS, could you ask your Mom how she grouped the photos? please? And, could I borrow you- I’m needing a guest writer, I’ve been a bit busy and my energy hasn’t been stretching quite far enough! You could ghost write perhaps? Kate!!!!! Hello from a colder climate. Of course you can borrow anything you want from us. We’ll ghost write for you any time. There a quite a few Roxie posts to choose from. Roxie and ZuZu are having an early morning breakfast right now, so the “Queen” is indisposed at the moment and you’re stuck with me. I group the photos when I add media by 1.choosing Create Gallery from the top left, 2. selecting the photos and 3.then there are choices you can make as to how they are displayed. You can choose the size and I use medium and then I choose “mosaic tiles”. I’ve also used squares and circles and have even done a slide show. But that’s the extent of my techie knowledge. How nice to read this on a Sunday morning (still in pjs)! Roxie, I’d love to adopt you but I’m afraid you wouldn’t much like the weather in Scotland. We don’t have any snow but it has rained for weeks! We’d keep the house nice and warm for you, though. And never call you by your last name! Mary, for the first time I clicked on your picture and arrived at your wonderful web site. Why have I not been able to do this in the past? I’ve been reading about you, your past and your present and your projects for the last hour. But there is no where to “Like” or comment. So here’s my comment: You are an incredibly interesting world-wind of a person! Dearest Bean, You must hate all of this snow on your tiny paws. Have your Mom buy you some mittens and stay warm. Roxie purrfect, better appreciate where you are and love your humans. Soooo cute the way this is written. Roxie is quite the charmer, isn’t she? Just look at that face. It tells it all. And she definitely agrees wholeheartedly. You know how to write an engagingly funny blog post, Roxie. I can see how much you really want to help your mom, and I hope she appreciates your efforts. And yes, I think you really should have a middle name, like Sweetie, or Cuddles, or even Honeybun. You really are a treasure and need another name besides Dammit. I can understand how difficult it must be to keep your temper with all those snowmen taking over your favourite napping places. Your mom is a great writer and I’m sure she’ll write that book about you before too long. Meanwhile…just try not to break anything else in the house and you’ll really impress her. Millie, Mom tells me how much she loves your blog posts and she’s looking forward to reading your books as soon as she finishes her mystery. I hope everything is going well with your latest book and if you ever want to write a historical adventure featuring a beautiful, enticing and exotic gray tuxedo cat, I could be coaxed into being your muse. Ha ha ! Roxie, I could probably find you a place on one of my Viking ships! I hope you can row. 🙂 Instead of munching the new rug for the FruFru room, how about chewing a nice cat biscuit or two? Love your new name, by the way! Cuddles to you, Roxy. 🙂 ps. I’m going to read your mom’s book too, as soon as I’ve finished writing mine – and the one about you, when that’s done. You are incorrigible, Roxie Goddess Dammit! I’m sure a book about you will be very exciting and action packed. I’m looking forward to reading it! As for Goddess . . . Oh my! Millie, Mom always makes a mistake and says God, but we know I’m a girl, so I’ve changed it. Ah… this could get confusing, Roxie. As long as you know what you are. Mom is probably just overtired. Hi Roxie, it’s a tough life dear! Spring will be here soon and painting will be done! Lynn, Mom’s been taking time out from writing to read your new blog posts. She loves them. And I got to overhear your singing this afternoon on that video.It made me purr!If you take requests, I just love My Funny Valentine. Your friend, Roxie D.
Roxie Dammit is a perfect name for a cat. And such a perceptive one at that! As I recall, cats and wall paint are not meant to be together. Best of luck with your painting project. Thank you, Ally. And the wall paint was cocoa colored and cats and chocolate do not go together, either. Needless to say, Mom made it very clear about keeping my paws out of the can. But you should have seen her paws after she stained the shelves. I wouldn’t let her pet me for a week! You’d think she’d have used those rubber globes Dad bought for her! Duh! Oh dear Roxie, so under-appreciated! Not sure if any Aussies have offered you a home, but I would say the program of injections, looong plane flight and minimum 10 days in quarantine may not be to your pleasing 😦 Hopefully things will improve at home once the reno is finished (that’s a joke by the way, renovations are as long as a piece of string). Carolyn, What a novel idea! I’m going to show this to ZuZu. She’ll be quite jealous! Thank you and feel free to call on me when you are in need of inspiration. Your friend, Roxie G.D.
😀 Roxie, I always enjoy your furry, four-legged view of the happenings at your place. p.s. you know it’s always warm in the sub-tropics where I live. But hey, your Mom would miss you terribly. Dear Gail, you had me with “sub-tropics”. It sounds marvelous. If I can’t get there, I have a pesky little tabby cat I’d be willing to ship out to you. Just tell me where to address the parcel. (I won’t forget the air holes!” Love, Roxie G.D.
We need to work on the “Do no evil” concept with her! Hey Roxie, I’m feeling your pain sweetie! It’s not snowing here, but it’s been cold!! Ya wanna move to FL? I can pretty well promise no snow! The last time I saw any here was in 1978. So, I think we’re safe. We need to remedy the no middle name thing. Just tell me which one you prefer, and I’ll make sure I use it!! Love you , Roxie my pet!! Oh, Melinda, a place where it doesn’t ever snow! Do you live in heaven? Your friend, Roxie D. HAHA!! Weeeeell, sometimes in the summer, you might think it’s the other place!! Hmmmmmmm? OK. Maybe I’ll just stay put for now. sigh I’m disappointed, but I’ll try to manage my heartbreak. Enjoyed dropping by on this post. Love the beauty and life of your blog. As an Auzzie it doesn’t ever snow where I live. In fact even winter’s here are quite pleasantly warm (mostly). Christmas however, can be very, very hot. Many folks can’t imagine have a Christmas where all the baubles and streamers simply d r o o p with the heat. Thanks for your writing. ZuZu here. I don’t get it. Here I am the central character of A Berkshire Tale but not once has a blog been written about me! Yet my older sister Roxy seems to be in print with pictures none the less, every month. Something just doesn’t seem right here. Here I am the cute one who is never underfoot like that other cat who lives in this house. Yet she gets a fan club! What’s a cat got to do around here? Well that “sister” of mine better watch her step. In case she forgot, I’m the one with all my claws. Foxy Roxy Girl, I lived in Syracuse which averages over 100 inches of snow ever winter. Just like you, we got pretty tired of it! 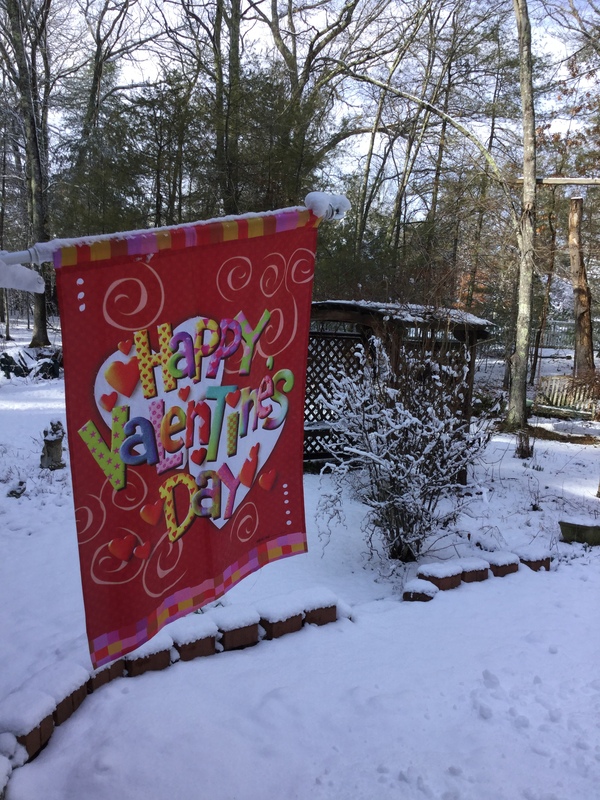 Now, I live in North Carolina where every now and then it snows, but more often it feels like the spring or fall in the north. (This week a few days will even be in the 70s!) Outside here I come. I would invite you for a visit so you could warm up…but…well, how do you feel about dogs? It’s warm in RI this week and there’s no snow. I’ll store away the invitation for awhile and thanks for the invite. No, Roxy, she is only 3 and pretty big, a German Shepherd, though not a huge one. We only gave her two names, Nessa Eddy, but when she was at the shelter she was called Princess. Hard to be angry and call out, “Princess Nessa Eddy, what have you done?” It you can’t stop Mom and Dad going to Pinehurst, they would go further south past us and a little west. We live in Edenton, which is on the Albemarle Sound near the coast, the earliest capital of North Carolina amid very old historic horses. Nessa is a bit of a bouncy girl…she had heart worm when she came to us so had to be pretty quiet, and now is making up for lost time! Dear Jo, Princess Nessa Eddy is a lovely name and I like her spirit. I’m glad she got rid of the worm. ( My little sister eats bugs and it grosses me out! )But she sounds a bit large to me and very young. ZuZu is younger than me and I spend most of my time babysitting for her while mom and dad go on adventures. I’m being really good this week because of that conversation I overheard. I haven’t destroyed anything. I haven’t pulled Mom’s hair or bitten her. I haven’t poked ZuZu in the eye. I haven’t tried to run out of the house and escape. I am really being good and I just don’t know how long I can go on like this. It’s very stressful. (I think Mom would really like Denton, but I’m not going to give her any information that could result in lengthening vacations time!) Yours truly, Roxie D.
Simply delightful! You are a great storyteller! The children must have thoroughly enjoyed you in their classroom—thinking back to the 3rd Graders! Not as much as I did being there, I’m sure. Thank you, Jane. Lots of stories to tell. I’m sure Roxie, that all the painting efforts are ultimately directed towards making you a happier cat. Be patient, your parents mean well.